Today we’re excited to ship and launch Travis CI Enterprise, a self-hosted version of Travis CI that runs inside your datacenter. Over the past months and years, we’ve been approached many a times by companies wanting to run Travis CI on their own premises, utilizing their internal GitHub Enterprise installations. Travis CI Enterprise supports GitHub.com and GitHub Enterprise, allowing you to bring all the features that make Travis CI great into your own datacenter, making it easy to scale out build infrastructure based on your company’s needs. With Travis CI Enterprise, you can fully utilize internal and existing infrastructure. Whether you’re using OpenStack, VMware, or bare metal servers. It’s optimized to run on EC2 as well, and it’s fully based on the new Docker build stack that we shipped earlier this week. Running on EC2 allows you to scale out capacity and save costs based on demand throughout the day or week. With Travis CI Enterprise, you can customize the build environment to reflect your specific needs. Whatever services and language versions you need to have installed by default, thanks to Docker, you can provide your own images, speeding up builds significantly, removing the need for any customization and slowdown during the build. Just like hosted Travis CI, our Enterprise version integrates with your existing GitHub instance. You can easily use it with LDAP directories, as login, authentication and authorization are strictly tied to the users you already have set up in GitHub Enterprise. Send us an email, and we’ll get you set up with a trial. Does Travis CI Enterprise support Stash, Gitorious, or any other version control system? 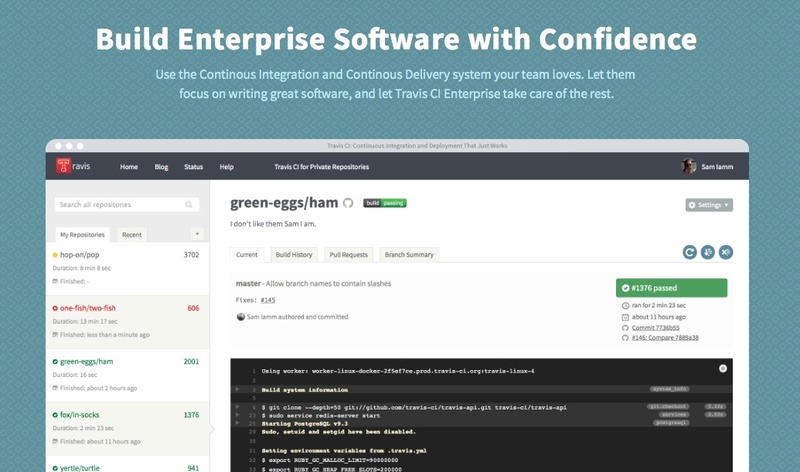 Travis CI Enterprise focuses on a tight integration with GitHub and GitHub Enterprise. While we don’t have immediate plans to support other platforms, do get in touch if you have specific needs, as that gives us clues for our product roadmap. We ship you a set of two images, one containing the base installation, and another one that includes the job worker, which you can install on the machines you want to dedicate to running builds. Can I provide my own Docker image? Yes, you can. Travis CI Enterprise fully supports bringing your own set of images so you can tailor the build environment to suit your needs. Can I dedicate more resources to my Docker containers? By default, the containers run with 2 cores and 4 GB of memory. While that can’t be customized just yet, it’s something we’re looking into adding in the future. Want to try out Travis CI Enterprise on your infrastructure or on EC2? Get in touch, and we’ll get you set up!.